Interoperability is arguably one of the hottest buzzwords in health care. Federal rules have made exchanging information between separate HIT systems vital to any hospital’s success—particularly larger health systems with various points of care. As providers shop for HIT solutions, it’s in their best interest to partner with vendors that can offer truly interoperable solutions and ongoing support that will benefit the entire facility. It’s not just government regulations that are pushing hospitals to prioritize interoperability, though. Today’s health care providers must share disparate pieces of information regarding everything from nursing notes and financial data to medication and supply inventory outside of a hospital’s four walls. As it stands, approximately 90% of hospitals use six or more devices that could be integrated with EHRs, but many are missing out on the opportunity for success at hand. In an effort to capitalize on this need, more vendors are touting their level of interoperability to attract new customers. Interoperability today has taken on several meanings. What many vendors will refer to as interoperability often is just the exchange of data back and forth from one system to the next through basic communication protocols or interfaces. While important, this connection between systems does not solve the critical workflow and efficiency challenges that end users require and, in many cases, are starting to demand of their vendors. Various models have been developed to distinguish between the different levels of interoperability. General consensus within the industry holds that, in time, all hospitals and health systems will demand a dynamic system that recognizes not only the data state but also the system needs. For example, the Health Level Seven International community defines the three types of interoperability as technical, semantic, and process. Technical interoperability simply delivers data from point A to point B, while semantic enables points A and B to understand data in the same way. Meanwhile, interoperability that delivers value at the process or workflow level is considered to offer hospitals the truest, most comprehensive form. Despite these distinctions, vendors tend to tout their level of interoperability when two systems are doing no more than passing data back and forth through basic interfaces, and the end user is forced to take multiple steps between systems (ie, calling up patient information, checking the information, and then manually entering steps taken in a separate application into their primary application). This is not “true” interoperability. The end user sees minimal benefits, at best, from this level of integration. When selecting an HIT vendor with which to partner, health care organizations must weigh several key factors. Providers shopping for new health technologies should keep in mind that if a solution claiming to be interoperable still requires providers to call up patient information or manually enter data from a different application into their primary application, it will not offer the full array of benefits the providers likely will want and need. There are products on the market today that offer interoperability at the process level and will require less labor and provide much greater pay off. Ultimately, providers should be looking for scenarios in which vendors partner together to solve the workflow issues created by connecting disparate systems. 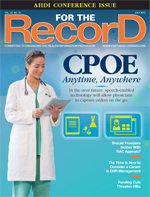 Different interoperability capabilities for EHRs and point-of-care technologies create another conundrum. Integrating point-of-care technologies such as medical devices, including ventilators and monitors, poses a unique set of challenges and opportunities. Because only about one-third of hospitals actually integrate medical devices with EHRs, there is tremendous growth potential in this area. Even among hospitals investing in interoperability, research from HIMSS Analytics shows that most integrate fewer than three types of devices. Because EHRs traditionally are built as transactional systems and not optimized for continuous high-volume, low-latency data for medical devices such as monitors and ventilators, the two can be particularly challenging to integrate. The most important workflows on medical devices tend to be local and urgent, occurring at the point of care and alerting patients and providers in the moment. The granularity and customization required can make the integration between medical devices and EHRs more complex. Purchasing interoperable technology is only the start. Providers must ensure they develop and maintain an effective interoperability strategy even after purchasing and implementing new technology. To reach this goal, they should consistently look for opportunities to streamline workflow between major system vendors. Some vendors will be able to offer this integration in tandem with their offerings. Providers also should remember that they are customers. Health care organizations should select vendors that will prioritize the provider’s needs and generate support throughout the life of the technology. Providers should consider where they have invested the most money and seek to maximize this investment by ensuring that those systems are integrated and functioning at their highest performance level. Providers must promote the value of their integrated system to employees. When staff members don’t know about the advantages of interoperability, they are less likely to appreciate and utilize the system’s capabilities to their fullest extent. By partnering with vendors that are committed to providing hospitals with truly interoperable technology and maintaining an ongoing, effective data exchange strategy, hospitals can boost staff workflow, improve patient safety and care coordination, and achieve long-term financial gains. Although the search for interoperable technology certainly presents challenges, hospitals are best served by embracing the technology that delivers value at the highest process levels. Those that leverage interoperability’s assets to their fullest extent in their clinical workflows can expect to reap the greatest benefits from the other technologies they implement. — Kristin Russel is senior director of product development and marketing for Omnicell.